The vagrant reports keep coming in. On August 26 Jeff Clements documented the first ever occurrence of Fiery Skipper in New Brunswick. Check out Jeff’s photos here. Fiery Skipper is a resident species in the southern US and Latin America that wonders north in variable numbers every year. It is more or less annual in extreme southern Ontario, however this year the species has been seen in numbers in eastern Ontario, and at least one has been reported from Quebec. The only other Maritimes record of Fiery Skipper is a specimen that was collected in Charlottetown, PEI, in 1947. Fiery Skipper, a species to watch for. Photo taken by John Klymko, September 2, Hamilton, Ontario. The last post featured the first ever record of Giant Swallowtail for New Brunswick. There are two additional records to report – Marjorie Sharpe photographed the species at Upper Coverdale on August 7, and Andrew Macfarlane photographed the species at Jolicure on August 22. With the warm weather forecast for this week there is great potential for more vagrants. 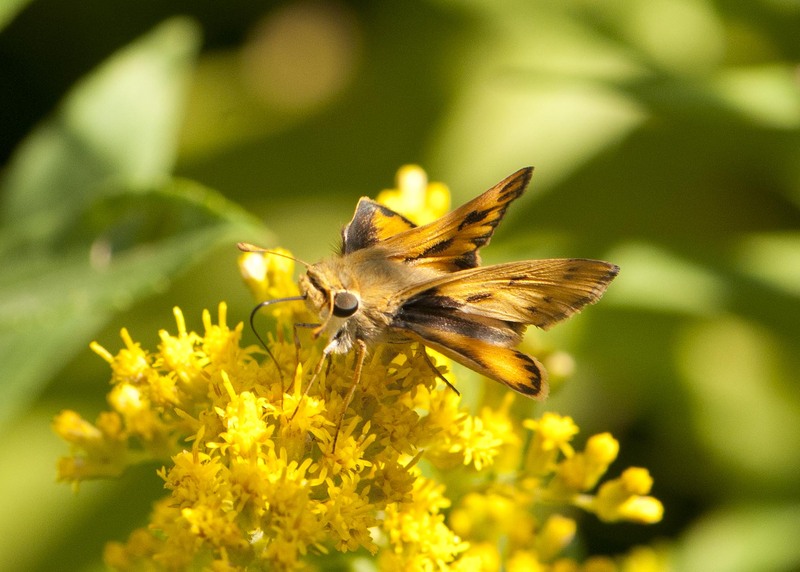 Giant Swallowtail has been photographed in Montreal as recently as August 28 and Fiery Skipper has been reported from Ottawa as recently as September 7. Long-tailed Skipper, which would be a new species for the Maritimes, was photographed August 29 and 31 in Maine. Check out a photo of one of the Maine Long-tailed Skippers here. There have been some other excellent reports since the last blog post. Rita Viau photographed a Grey Hairstreak at River Bourgeois, Cape Breton, on August 26. This is the first Cape Breton record for the species. Denis Doucet photographed Kouchibouguac National Park’s first record of Bronze Copper on August 22. This is one of a number of new New Brunswick locations for the species this year. For more information on these new locations check out the discussion on BirdingNewBrunswick.